Items sold separately: Conductive sock electrode, and grounding cuff. The Ultima Neuro works in tandem with high-quality silver conductive material to deliver nerve targeted electrotherapy signals to treat your condition. The Ultima Neuro was designed specifically to treat pain associated with Neuropathy of the Hands and Feet. And with a li-ion battery, the Neuro is equipped with a long life battery that is ultra slim. Neuropathic pain is often worse at night, seriously disrupting sleep and adding to the emotional burden of sensory nerve damage. The Ultima Neuro is an effective, drug free, non-surgical solution to the relief of early onset Neuropathy. In general, healthy habits such as maintaining optimal weight, avoiding exposure to toxins, following a doctor recommended exercise program, eating a balanced diet, correcting vitamin deficiencies, and limiting or avoiding alcohol consumption can reduce the physical and emotional effects of peripheral neuropathy. Medication is also a common form of treatment, however, not without its side effects. As a new medical device treatment option, the Ultima Neuro Hand System, provides a non-invasive and non-narcotic treatment on afflicted hands and feet to reduce the pain, discomfort and symptoms associated with this painful condition. The Ultima Neuro has been built with comfort and convenience in mind.The Ultima Neuro works in tandem with high-quality silver conductive material to deliver nerve targeted electrotherapy signals to treat your condition. 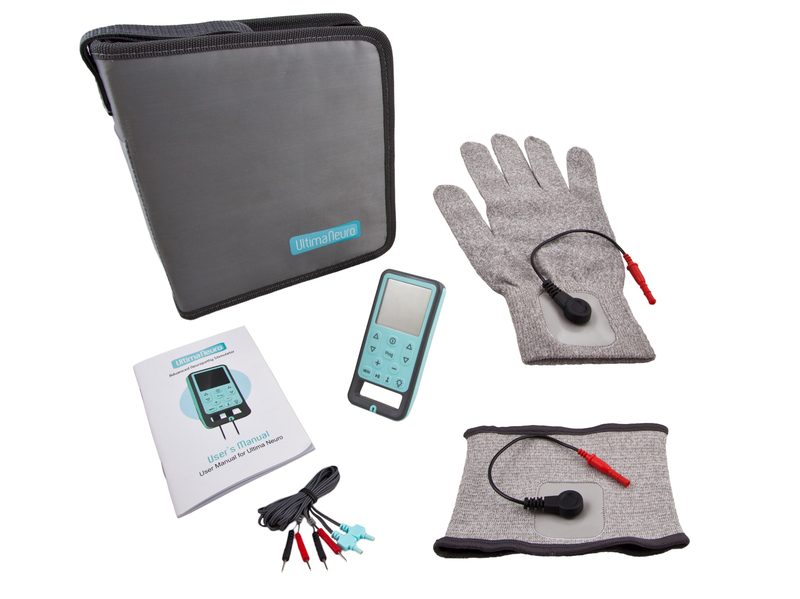 The Ultima Neuro also includes a TENS setting for additional functionality in treating a wide variety of other pain related ailments and at different areas of the body other than the hands and feet. The Neuro A and B mode are the main Neuropathy treatment modes, and have been specifically designed to target this type of nerve pain. As well, the Ultima Neuro offers TENS treatment sub-modes that can be used to treat a wide range of other nerve pain conditions. The Ultima Neuro was designed to treat Peripheral Neuropathy of the hands and/or feet through treatment wraps that cover the extremity with circumferential electrotherapy stimulation. However, pre-gelled electrode pads can also be used with this system to treat other parts of the body if needed. The Ultima Neuro is based off of TENS and Micro-current therapy settings, however,the Ultima Neuro goes beyond TENS by narrowing the output parameters to target the relief of peripheral neuropathy in the hands and feet. Unlike a basic TENS stimulator, the Ultima Neuro signals are vastly more advanced and precise with an auto-feedback loop that allows the Neuro to regulate the voltage based on different tissue masses. So the stimulator knows when it is treating a heavy set person, vs. thin. This auto adjustability helps tempo treatments to the individuals needs (i.e. impedance of tissue mass). Also, in the Neuro there is a monophasic waveform that is typically associated with pushing and moving fluids – which is a particularly effective wave form in treating pain associated from Neuropathy. The Ultima Neuro was designed specifically to treat pain associated with Neuropathy of the Hands and Feet, and is intended to help relieve the very painful symptoms of early onset Neuropathy. The Ultima Neuro is an advanced electrotherapy device that works in tandem with effective and efficient silver fiber conductive therapy socks and gloves. The electrotherapy cuff is used as a dispersive ground pad for the current. And with a li-ion battery, the Neuro is equipped with a long life battery that is ultra slim. The name of the condition is described as follows: Peripheral: Beyond (for example, beyond the brain and the spinal cord. )It refers to the conditions that result when nerves that connect to the brain and spinal cord from the rest of the body are damaged or diseased. The peripheral nerves compose an intricate network that connects the brain and spinal cord to the muscles, skin, and internal organs. Peripheral nerves come out of the spinal cord and are arranged along lines in the body called dermatomes. Usually, damage to a nerve will affect one or more dermatomes, which can be tracked to niche areas of the body. Damage to these nerves disrupts communication between the brain and other parts of the body and can impair muscle movement, prevent normal sensation in the arms/hands and legs/feet, and cause pain. Symptoms are specific to the type of afflicted nerve and may be seen over a period of days, weeks, or years. Muscle weakness is the most common symptom of motor nerve damage. Other symptoms may include painful cramps and fasciculations (uncontrolled muscle twitching visible under the skin), muscle loss, bone degeneration, and changes in the skin, hair, and nails. Neuropathic pain is difficult to control and can seriously affect emotional well-being and overall quality of life. Neuropathic pain is often worse at night, seriously disrupting sleep and adding to the emotional burden of sensory nerve damage. Patients who are pregnant or nursing should not use the device and it should only be used under the continued supervision of a physician.